One of the great features of the TouchMix family is the ability to control them remotely from wireless devices. Up to twelve devices can be used at once and may be any combination of smart-phones or tablets running on iOS or Android. Here are a few things to know that will help you get the best results with your TouchMix and wireless devices. The world record for successful Wi-Fi transmission is 260 miles (420 km). You probably don’t need to control your TouchMix from this distance. If you do set up a Wi-Fi link with this kind of power, expect a visit from the radio spectrum regulatory authorities. Under ideal conditions, a good quality router with external antennas may have a range of up to 330 feet (100 m). But that range will be greatly reduced by obstructions, position of the devices, and interference from other radio frequency energy. Microwave ovens, cordless phones and emissions from all the cell phones in the purses and pockets of an audience can interfere. For smaller spaces with fewer potential sources of interference, a USB Wi-Fi Adapter such as that supplied with the TouchMix-8 and 16 will work well. But USB adapters are going to have less range than external routers due to their lower-power radios and tiny, less efficient antennas. In a larger space with more potential interference and more mission-critical remote control requirements it’s better to have a higher-powered device with more efficient antennas. That’s why there is no USB Wi-Fi Adapter included with the TouchMix-30 Pro – it’s likely to be used in more demanding applications and an external Wi-Fi router is the best solution. That said, the TouchMix-30 Pro will work with the QSC-supplied adapter (pictured below) marked with an “N”. It is available here https://parts.qsc.com/cp-000033-00 . But be aware that its range and connection reliability will be inferior to most external routers. Let’s talk about the ways a TouchMix mixer can be connected to a tablet or smartphone via Wi-Fi. In this implementation, the USB Wi-Fi Adapter becomes the access point to the mixer. All you need is your mixer, a Wi-Fi Adapter and one or more wireless tablets or smartphones. Advantages – Convenience. The Wi-Fi adapter can stay plugged into the mixer and there’s no need to connect any other gear. Adapter is supplied with TouchMix-8 and 16. Disadvantages – Shortest range and least robust connection. In this implementation, a Wi-Fi router connected to the mixer is the access point to the mixer. The TouchMix-30 Pro connects directly to the router using CAT5 cable. 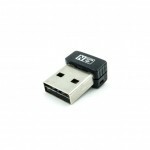 TouchMix-8 and 16 require an inexpensive USB to Ethernet adapter – for more information see https://www.qsc.com/live-sound/resources/software-and-firmware/touchmix/ethernet/. Advantages – Simple to set up. Good range and robust connection (depending on the Wi-Fi router). External routers will have higher power and better antennae compared to a USB adapter. Many of them will also be able to operate in the less crowded 5 GHz channels. Disadvantages – More gear to carry and connect. It’s also possible to connect wirelessly to an existing network. Your tablet connects to the mixer through the existing network. This may be done using either the USB Wi-Fi adapter or a Wi-Fi router. Advantages – Range and connection quality can be as good as the existing network. Disadvantages – Can be more complicated to set up and the facility that owns the network will have to allow access and provide log-in. The TouchMix has to be close enough to a network Wi-Fi node for a good connection. If there is an existing network with good coverage and you can plug into it, this is a great solution. The TouchMix-30 Pro connects directly using CAT5 cable while the TouchMix-8 and 16 require a USB to Ethernet Adapter – for more information see https://www.qsc.com/live-sound/resources/software-and-firmware/touchmix/ethernet/. If the network has been set up by IT professionals, they may be reluctant to allow it. But if they do, they will want to know two things. What port do you want them to give you? Answer – any open port will work. The mixer will find it. And, what services to you need? Answer – none. The mixer implements zero-configuration networking using Bonjour. Advantages – Good to excellent range and reliable connectivity (depending on the quality of the existing network). A great solution for mixers used in a fixed location. No additional gear needed other than a CAT5 cable. Disadvantages – Not a solution for mobile applications. Can’t depend on availability of or access to an existing network. We have successfully used a wide range of external Wi-Fi routers. Even inexpensive devices ($40 USD) have worked well. One of our favorites is the Apple Airport Express. It’s a bit more expensive than other routers we’ve used ($99 USD) but it’s compact and capable of 2.4 or 5 GHz operation. And it has a 3.5mm audio output jack that can be connected to a stereo input on the TouchMix so that Apple AirPlay may be used for wireless music playback from an iOS device. Here are a few other Wi-Fi tips. When connecting an RJ45 cable to a multi-port router, do not use the internet port. That’s the one that’s usually a different color than the other ports. Follow the manufacturer’s directions when setting up the router. Avoid doing any unusual, custom setups unless you really know what you’re doing. QSC does not support the use of off-the-shelf USB Wi-Fi adapters for TouchMix. QSC has used two different suppliers of these for the TouchMix-8 and 16. Only one of these will work on the TouchMix-30 Pro. It is labelled with the letter N and is available from QSC as a service part https://parts.qsc.com/cp-000033-00. The TouchMix-30 Pro does not include a Wi-Fi USB adapter. The larger spaces and more demanding applications this mixer is used in are likely to require the higher power radios and more efficient antenna systems found on external Wi-Fi routers. If you wish to use a Wi-Fi USB adapter, understand that its range and the reliability of connection will be inferior to that of external Wi-Fi routers. A compatible adapter (pictured below) is available from QSC as a service part here https://parts.qsc.com/cp-000033-00. This is the same adapter supplied with the TouchMix-8 and 16 mixers. No other USB Wi-Fi adapters are supported. QSC has successfully used a wide range of commonly available Wi-Fi routers. Follow the manufacturer’s directions when setting up the router. Avoid doing any unusual, custom setups. Download the TouchMix-30 Pro User Manual. Go to https://www.qsc.com/live-sound/products/touchmix-mixers/touchmix-30-pro/ and click “Documents” to select a language version. Use the mixer’s Info system. Info > Misc. Features > Network Setup. Learn more about TouchMix professional digital mixers.